In its natural state the Assabet was a glorious little river, but historically it took awhile to settle on a name. Old maps show Assabeth, Asabet, Elizbeth, Elizabet…all thought to be Anglicized versions of an Algonquin Indian name. One of the alternative names is preserved in Elizabeth Brook, a tributary that flows southwards through Stow before merging into the Assabet River. Given its modest length and modest volume, the Assabet was an extremely 'worked' river, meaning that little remains of its original natural state. From the headwaters, where a dam insures less flow in times of flood and more flow in times of drought, to the conflux 31 miles and 220 feet lower in elevation where it merges with the Sudbury River to become the Concord River, the Assabet had powered eight mills, has its high water rampages hobbled by flood control dams, suffered channeling between restraining walls through the centers of Hudson and Maynard, lost water to our various usages, and gained water back from our numerous waste streams. From Thoreau's journal entry in 1859: "So completely emasculated and demoralized is our river that it is even made to observe the Christian Sabbath... for then the river runs lowest owing to the factory and mill gates being shut. Not only the operatives make the Sunday a day of rest but the river too, to some extent, so that the very fishes feel the influence...of man's religion." His point here is that natural flow was stopped Sundays so as to back up as much water as possible before work started again Monday morning. The Assabet was also an extremely polluted river. As Ann Zwinger wrote in A Conscious Stillness (1982) "...the reach above the Powder Mill Dam is closed by joint action of the Maynard and Acton boards of health...the river smell is nauseating, reeking like an unpumped-out campground outhouse times ten." By then, the issue was no longer industrial pollution left over from the mills that had dotted the Assabet River and its tributaries. Rather, the smells emanated from rotting of bacteria, algae and water plants such as duckweed - the consequence of eutrophic growth promoted by the excesses of phosphorus and nitrogen entering the water from wastewater treatment plants (WWTPs). Five of these return cleaned water to the Assabet. Their combined volume is so great that in the low flow months of summer much of the river water is processed water. Surface water run-off of fertilizer from farms, golf courses and lawns also contributes unwanted nutrients, as does untreated stormwater from roads and parking lots. 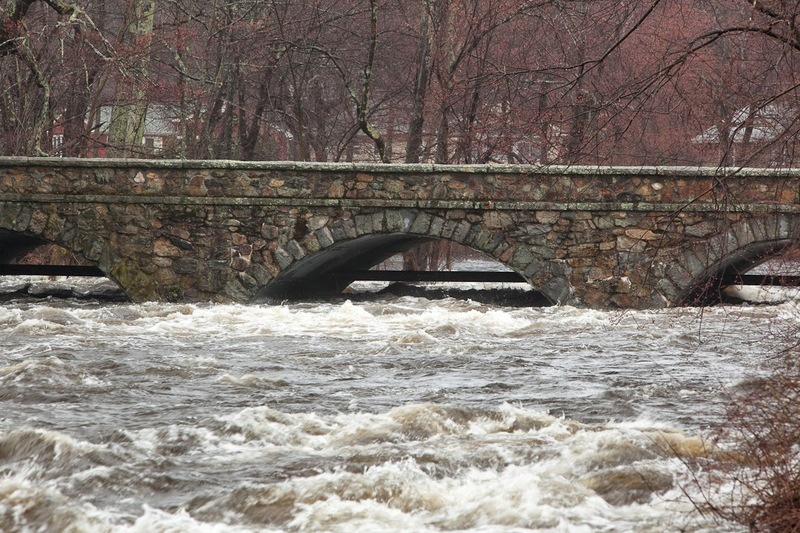 Assabet River channeled through the center of Maynard, 2010 flood. Until quite recently the limits on phosphorus content of processed water were not stringent enough to lower the rampant warm weather plant growth. But starting in 2009 and completed in 2014, all of the WWTPs on the Assabet River now meet higher standards. Furthermore, effective January 1, 2014, lawn fertilizer purchased or used in Massachusetts may no longer contain phosphorus. Mid-summer phosphorus content in the river has decreased from 0.4-0.8 milligrams per liter to about 0.1 mg/L. A target for a healthy river is to get below 0.025 mg/L. Large amounts of sediment trapped behind dams harbors reserves of phosphorus and nitrogen, thus slowing the trend to a healthier river, but over time the water quality will continue to improve. All this focus on plant growth is not to say that local rivers had never suffered from industrial insult. Back in the day, wool arrived in Maynard unwashed. Cleaning it at the factory meant all the lanolin, dirt, urine and feces matted into the fleece ended up in the river, along with the chemical dyes and whatever. Children frolicked in the river behind the Main Street School (where Town Hall is now), but not downstream of the mill. One saving grace - the Assabet did not suffer the extensive mercury dumping that still haunts the Sudbury River. From 1917 to 1978 the Nyanza Color & Chemical Company operated a textile dye manufacturing factory in Ashland. Wastewater entered the Sudbury River via a tributary named Chemical Brook (how apt). The Environmental Protection Agency estimates that 45 to 57 metric tons of mercury were released to the Sudbury River. Other contaminants included chromium, arsenic, lead, and carcinogenic chemicals. The current advisory: "The general public should not consume any fish from this water body." Solid waste trash also contributed to the Assabet's lack of ambiance. In Maynard alone, decades of annual river clean-ups organized by the Organization for the Assabet, Sudbury and Concord Rivers (OARS) have removed more than 1,000 car and truck tires, tons of metal scrap and hundreds upon hundreds of pounds of broken glass. Intact glass bottles from 50-60 years ago have come out of the river. Ditto televisions, bicycles, shopping carts, beer cans... Cleaning up the river appears contagious, in that each year less new trash goes into the river. Coda: Fishing boating, canoeing or kayaking on the Assabet River all popular pastimes. Site [http://www.oars3rivers.org/river/recreation] has maps and guides to boat access points. The fishing information includes where on the rivers it is safe or unsafe to eat fish. In addition to the marked boating areas, local kayakers know that at just the right water levels it is possible to enjoy Class I-II rapids through the center of Maynard by putting in below the Ben Smith Dam. If water too low, cannot get past the shallows. If water too high there is not enough clearance under the sewage pipes that run under some of the bridges. Water depth was 7.1 feet at the gauge when this photo was taken. Except where otherwise noted, this site is licensed under a Creative Commons Attribution-Noncommercial-No Derivative Works 3.0 United States License.